For a printable version of this, download How To Read Your Bill. 1 Energy Charge is calculated according to the metered kilowatthours (kWh) consumed during the billing period. The per kWh rate is multiplied by the metered usage for the set billing period. Note: Two energy charges may appear during the transition between summer (June–Sept) and non-summer rate schedules. This reflects a meter read during two rate schedules. In the example bill to the right, the customer’s bill is for usage from May 9 to June 8; usage in May is charged at the non-summer rate and the usage in June is charged at the summer rate. 2 Energy Customer Charge is a set charge for all residential customers regardless of energy usage. This charge covers the cost to maintain facilities and infrastructure to continue supplying customers with reliable electricity and includes costs for meters, distribution poles, safety equipment, miscellaneous supplies, and account administration. 3 Clean Air Rider covers the bond payments for the Emission Reduction Project (ERP). The amount that customers pay on the clean air rider is dependent on energy usage. The rate of the clean air rider will change each year depending on the debt service payment schedule. The payments are scheduled to be complete by 2030. 4 Power Supply Adjustment is charged if the cost to supply customers with the electricity needed exceeds projections. This adjustment is made in cases such as high fuel costs, higher market pricing for electricity, or the load is higher than projected. This adjustment is based on usage. 5 Water Usage Charge is calculated according to the metered water usage during the billing period. The usage is based on the number of units of water used. Each unit of water equals 100 cubic feet of water or 748 gallons. The rate is an increasing block rate to encourage water conservation. 6 Water Customer Charge is a set charge to cover the cost to maintain water facilities and infrastructure. This can include items such as meters, pipes, fittings, excavation tools and machinery, and account administration. 7 Fire Hydrant Facilities Charge is for the installation, maintenance, and availability of water for the City and other emergency services, e.g. the fire department. All residential, commercial, and industrial water customers are impacted by the charge. It is based on the rate class, not the meter size. 8 State Mandated Water Charge is required by the MN Department of Health and funds the required testing for drinking water. 9 Products and Services area is where charges for additional offerings will appear. The additional offerings include SERVICE ASSURED® (RPU’s Underground Utility Repair Coverage) and RPU's CARBON OFFSET PROGRAM, which offers renewable energy credits (REC) for purchase as units of renewable energy. 10 Unit Charge The average water usage from January-March sets a base (or maximum) that you will be billed for the rest of the year. If your actual water usage in any month from April through December is less than the base (or maximum), you will be charged for actual use. In cases where your actual water usage in any month of April through December is more than the base (or maximum), then you will be charged the base (maximum). 11 Waste Water Customer Chargeis a fixed charge per sanitary connection made per month to cover the cost to maintain sewer facilities and infrastructure. 12 Storm Water Utility Fee is proportional to a property’s contribution to storm water runoff and impact on water quality. Every developed residential and non-residential property parcel is charged a fee based on its size, land use and the amount of impervious (or hard surface) area. 13 Storm Water Customer Charge is a monthly charge used exclusively to support the Public Works Storm Water Management program. 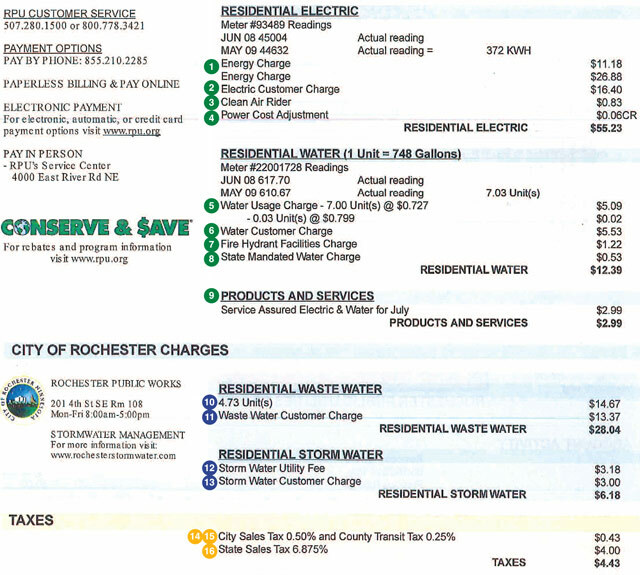 14 City Sales Tax is the additional sales tax that the City of Rochester imposes on all taxable items or services in the city, including utility services. The current city sales tax rate is 0.75%. 15 County Transit Tax is the additional sales tax that Olmsted County imposes on all taxable items or services in the county, including utility services. The City of Rochester falls within Olmsted County; therefore, this tax is required. The current county transit tax rate is 0.25%. This tax is used to fund maintenance on roads and bridges, construct public infrastructure, and for other transit and transportation projects within the county. This tax will change from 0.25% to 0.50% on July 1, 2017. 16 State Sales Tax is the sales tax charged by the State of Minnesota on retail sales of taxable products and services, including utility services. The current state sales tax rate is 6.875%. Note: Utility services are generally taxable; however, some exemptions may apply. Information can be found on the Minnesota Department of Revenue website to further explain possible sales tax exemptions. Customers who qualify for a sales tax exemption must provide RPU with a valid Certificate of Exemption (ST3 form). If you have further questions on your RPU billing statement, please call Customer Service at 507.280.1500. Contact a customer relations representative today at 507.280.1500 or email us.